The lush green color of the fairway and rough of par 5 1st hole is indicative of the stellar conditioning we found throughout Houston Oaks. The rolling hills of Houston Oaks Golf Course may be the Lexington area’s best kept secret to those golfers not from the Bluegrass region. It’s a fantastic golf course. Houston Oaks is an above-average layout that is kept in above-average condition year round (Bryan and I played Houston Oaks a few days before Christmas 2013). The course is challenging from the white tees, which play to a course rating and slope of 72.1 and 133 at just under 6,500 yards. And Houston Oaks is down right tough from the blue tees, playing to a course rating and slope of 73.8 and 137 at 6,848 yards. 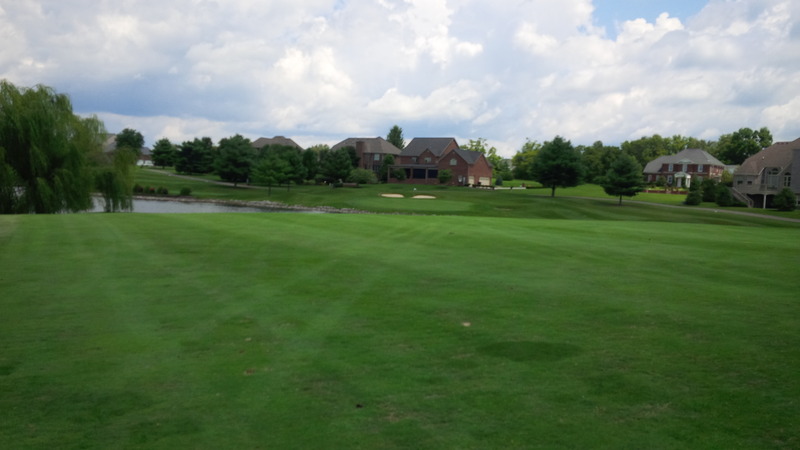 The front nine of this 1996 Jack Ridge design is routed across, over, and around the channel of the South Fork of the Licking River. 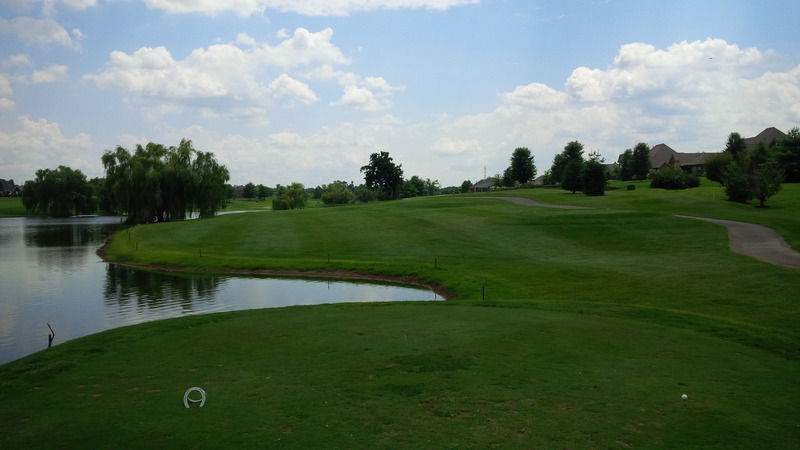 This small tributary of the Ohio River plays a prominent role on four of the first nine holes. A majority of Houston Oaks’ green complexes, like this one at the par 3 2nd hole are slightly elevated, allowing for some creative approaches and bunkering, as well as a firm, borderline unreceptive feel. The hills and flood plains carved and sculpted by river provide plenty of elevation change, making even the remaining water-less holes challenging. The front nine is almost completely devoid of housing, save for an adjacent old farm-house that separates the third hole from U.S. 68. Other than the trees growing from the banks of the Licking River South Fork, only a few specimen trees dot the landscape. 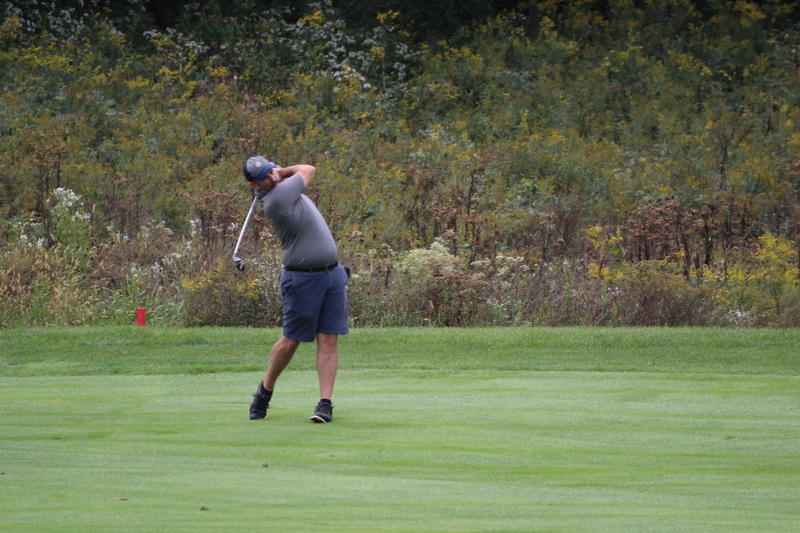 That leaves only the serenity of the surrounding pastures and cornfields, and the chest high wild grasses growing in between holes to interrupt and distract golfers from the gently sloping greens and wide, angled fairways. The back nine at Houston Oaks is a different animal, as the course is routed through the course’s residential development for a few holes on the way out and way back to the clubhouse. The houses adjacent to holes 10-13 and 17-18 don’t really come into play at Houston Oaks, but give those holes a different aesthetic for sure. The houses aren’t so close to the fairways or greens so as to actually affect play, but the homes, when combined with the two large man-made lakes, there is a different aesthetic to the back nine. 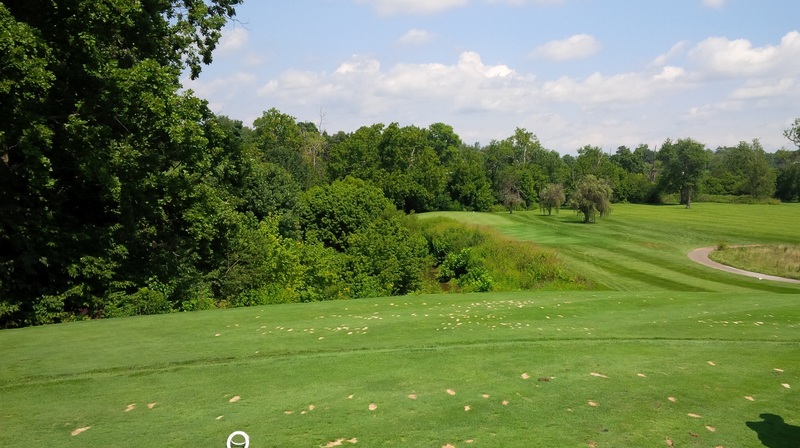 The intervening holes not adjacent to the houses and lakes return to the naturally splendid countryside vistas of the Licking River valleys, with a few holes incorporating elevation changes similar to those of the front nine. 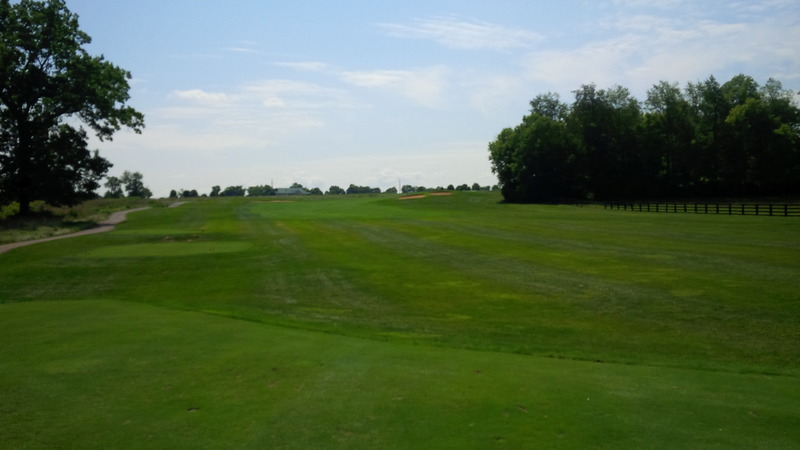 Throughout the course, the fairway landing areas are fairly generous. If you have any control of your driver at all, you should be able to play out of the short grass at Houston Oaks. 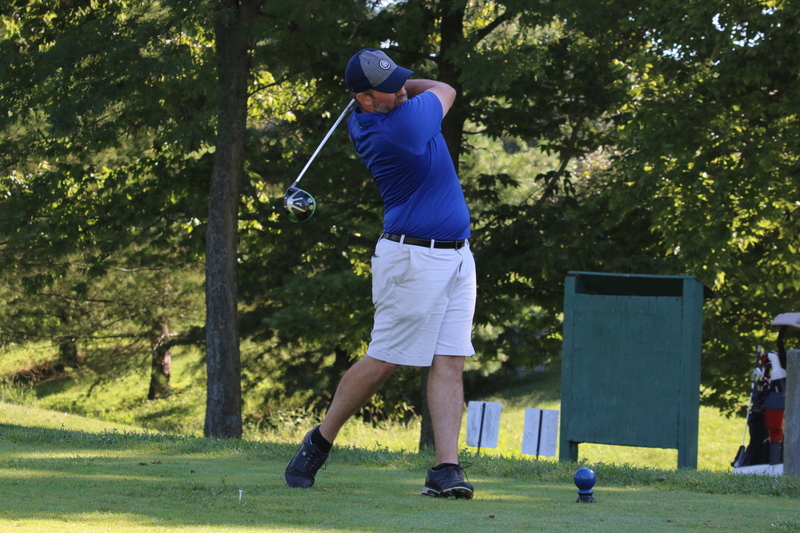 While many of the holes have fairways that gently bend one direction or the other, there are several holes that include sharp, almost 90-degree turns, notably the par 5 fifth and tenth holes. This semi-blind tee shot is characteristic of 3 of the 4 par 5 holes at Houston Oaks, adding intrigue and difficulty to the layout. On these holes, local knowledge of the course is invaluable to assist the golfer in picking a target and knowing how one can or can’t hit it without being out of position or in a hazard. 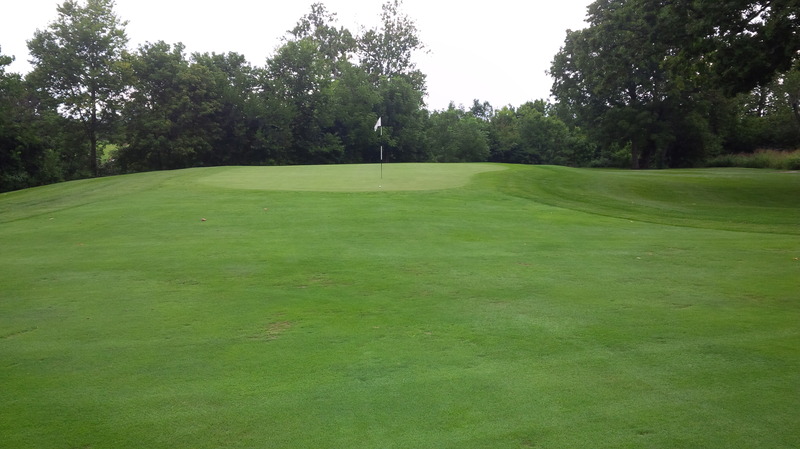 With the majority of the trees on the course hugging close to the routing of the Licking River, the wind plays an important role at Houston Oaks. Three of the four par 3 holes involve hitting from a significantly elevated tee box to a green well below with trouble on both sides, making judging the effect of the wind critical to scoring well. The par 5 holes at Houston Oaks are generally all three shot holes for me, given their length, elevation change, conspicuous hazards, and narrow greens. Each par 5 presents a unique and memorable challenge by avoiding repetition of the prior holes’ defining characteristics. Downhill to a narrow green with water and out-of-bounds left and long? Just a few of the challenges on the par 3 7th hole at Houston Oaks. The par 4 holes include a nice mix of long and short holes, varying between level, uphill, and downhill. The 4th hole is the signature hole at Houston Oaks for me, which also happens to be my nemesis hole. This long-ish dog-leg right par 4 has its fairway abruptly bisected by the Licking River, whose trees create a blind second shot towards the green if one lays back too far off the tee. The greens at Houston Oaks are generally fairly large and generally slope in one predominant direction. Each green has subtle contours, as well, but there is very little artificially undulation contained within the green complexes, which makes putting predictable, and therefore, a scoring weapon at Houston Oaks. Kudos to Houston Oaks’ management for their investment in refurbishing and maintaining their bunkers this year. Of special note were the bunkers at Houston Oaks this summer. 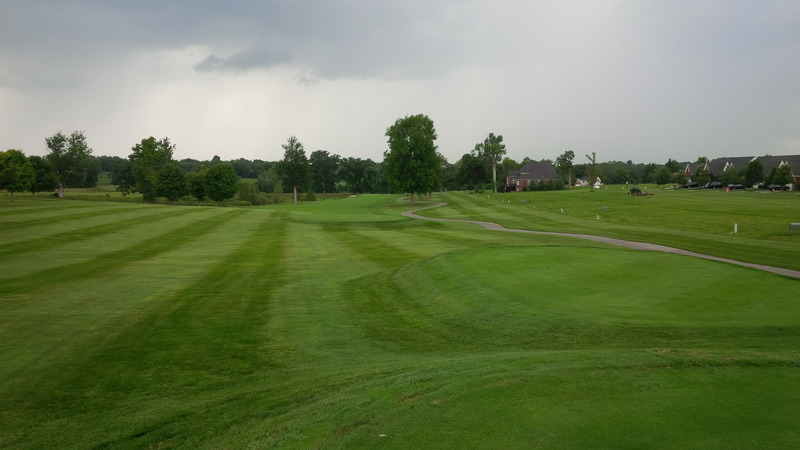 The course’s bunkers were full of light, white sand, with few indications of drainage problems and no clumpy, clay-filled disasters that have become all too common in Central Kentucky through budget cuts and neglect. The course is not in Lexington, but rather in Paris, Kentucky, which is purposefully “out-of-the-way,” located 18 miles due northeast of downtown Lexington. 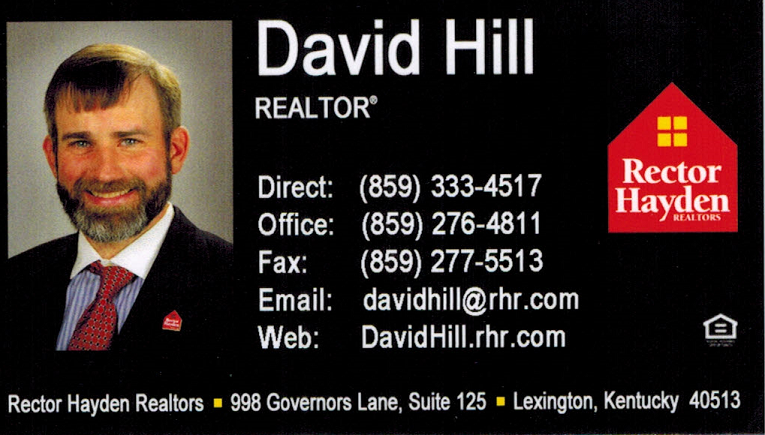 If the course were located inside New Circle Road in Lexington, it could probably charge close to double its $29 18-hole rack rate. However, for reasons beyond my comprehension, the golfers from Lexington don’t flock en masse up beautiful, horse farm filled Paris Pike to Houston Oaks Golf Course. Sure, it’s not the most exciting course in the area. 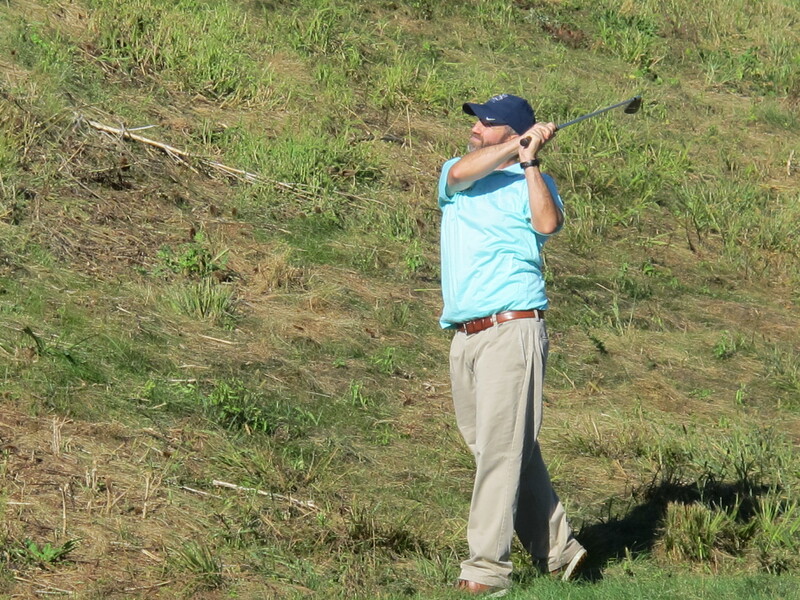 Put the ball in the fairway and you are going to have a good chance to make par or better. 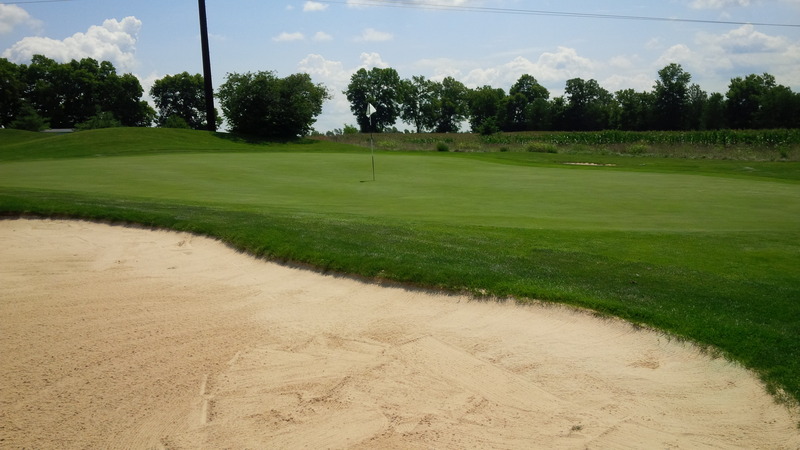 The greens are almost plain by modern standards, without a lot of tricks or visual intimidation. The par 5 17th hole provides one of the few real risk/reward opportunities at Houston Oaks, as a solid, well-placed drive allows one to consider challenging the creek dividing the green from the end of the fairway. 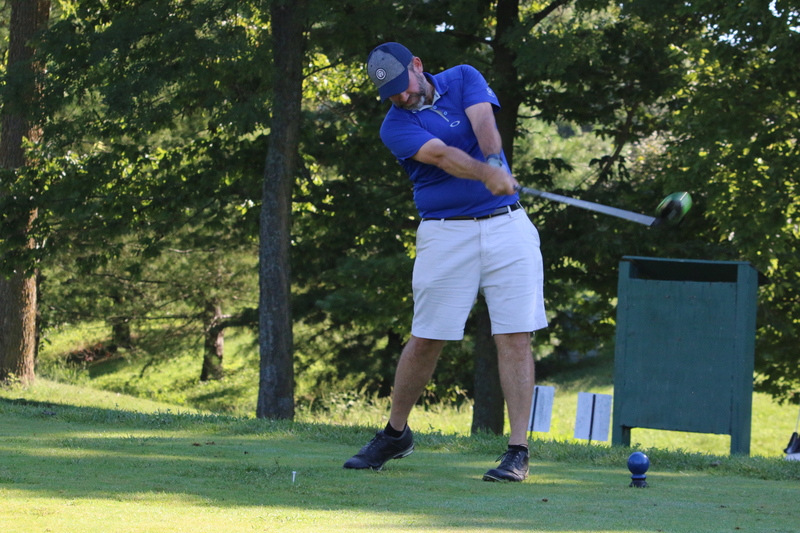 However, I don’t necessarily think a relaxing round of golf during which you don’t curse the architect and superintendent is a bad thing every once in a while. 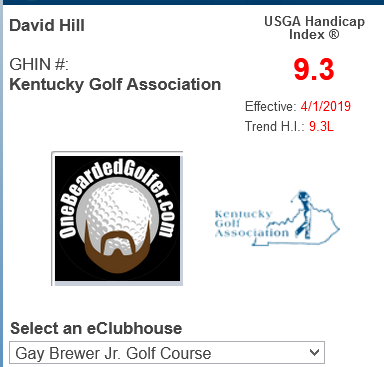 In a selfish way, I’m glad the course is a little out-of-the-way and less crowded than it should be, because I proudly include the course in my Top 5 public golf courses in Kentucky, and enjoy playing it every chance I get.